The Albany Bottle Drop can be a busy place at times. I was wondering about this on my latest visit to the Albany Bottle Drop operated by the Oregon Beverage Recycling Cooperative. The question is: As convenient as the operation is, will it and others like it be sufficient to handle the flood of empties that Oregon wants to be returned for deposits no later than Jan. 1, 2018? 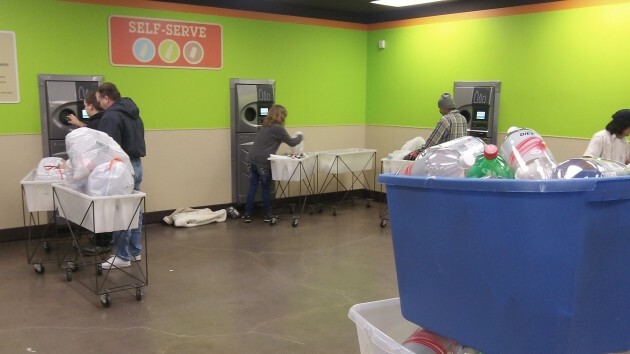 Some 2,369 people had opened accounts during the first 12 weeks, she said, not counting the hundreds of people per day who take their empties inside and feed them into the machines. Having an account enables people to buy bags, fill them with empties, drop them off any time of the day or night, and to have their deposits refunded to them automatically. So far the Albany center is the only one between Salem and Eugene. Bertges says Corvallis and Lebanon may get them eventually, but she had no information on the timing. So what happens in 2018, when under a law change adopted in 2011 stores will have to start charging nickel deposits on all beverage containers other than dairy, infant formula, liquor and wine? That will add juices, sports drinks, teas and coffees and who knows what else to the containers we will be expected to store and turn in for refunds. The last time I went to the redemption center — with about two bucks worth of empties (a paltry amount, I know) — I didn’t have to wait long for a machine to be free. But what happens in two years with a lot more containers eligible for deposits and refunds? Especially if the deposit goes up to 10 cents per container? The increase in the deposit amount will happen if the state determines that the number of empties returned has fallen below 80 percent of the number sold for two years in a row. The increase can happen as early as Jan. 1, 2017. OTOH, why not save your empties until they are worth twice as much. There weren’t ANY problems when the bottle bill was first introduced. Stores went to the machines on THEIR initiative. They slowly let that slide into a unpleasant redemption situation and nobody did anything about it. We didn’t need a redemption center. We needed the stores to fulfill THEIR obligation to process returnables in a relatively easy fashion. WHO was in charge? They should be executed for dereliction of duty! And when’s the last time you enjoyed a bit of humor? Does OLCC do it for free?